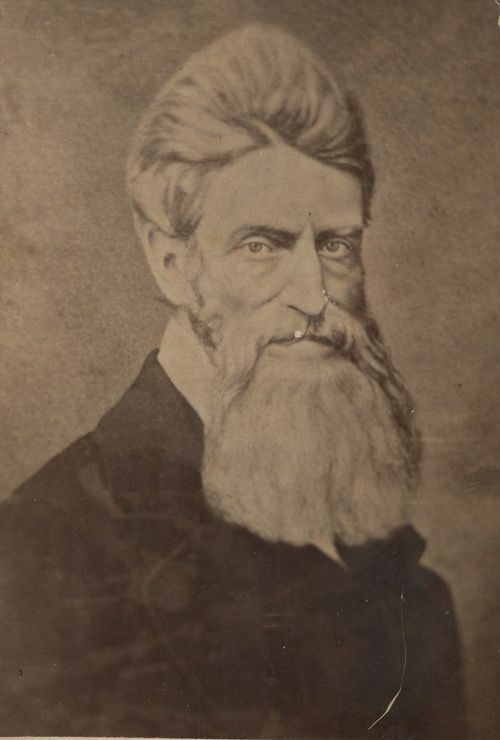 A cabinet card showing a portrait of John Brown with a beard. The portrait appears to be copied from a painting; however, the artist is unknown. Brown was an abolitionist and Free State advocate who used violence to end slavery. He was involved in the May 24, 1856, Pottawatomie Massacre, the Battle of Black Jack on June 2, 1856, and the Battle of Osawatomie on August 30, 1856. In October 1859, Brown and his followers attacked the federal arsenal at Harpers Ferry, Virginia. His plan failed and he was executed for his actions.